The aptly named widow Harriet Chance takes an unexpected and out-of-character cruise to Alaska, on which she discovers that her marriage of almost 60 years was not what she thought. Joined by her troubled daughter, and haunted (literally) by her dead husband, Harriet begins to question everything she knew about her life. Moving back and forth through time, presenting the events of her life as if it were a 50’s television show, the author peels away the layers of Harriet’s life to expose the dreams, decisions, and missed chances that brought her to this point. In turns funny and poignant, this novel is an empathetic look at those opportunities that slip through our fingers during the course of a lifetime. There, amid the overwhelming buffets and the incessant lounge singers, between the imagined appearances of her late husband and the very real arrival of her estranged daughter midway through the cruise, Harriet is forced to take a long look back, confronting the truth about pivotal events that changed the course of her life. And in the process she discovers that she’s been living the better part of that life under entirely false assumptions. 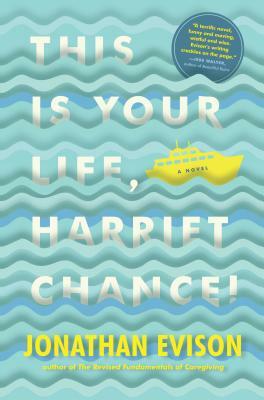 In This Is Your Life, Harriet Chance! Jonathan Evison has crafted a bighearted novel with an endearing heroine at the helm. Through Harriet, he paints a bittersweet portrait of a postmodern everywoman, her story told with great warmth, humanity, and humor. Part dysfunctional love story, part poignant exploration of the mother-daughter relationship, nothing is what it seems in this tale of acceptance, reexamination, and forgiveness.